Online marketers always get a tough start. They need to publish to the largest audience in the world (the internet) – right from the start. That means we feel very uneasy when publishing our first content pieces. Here is how this can become easier! – Why online marketers, in general, will always feel uneasy in the beginning. – How to face your fear and feel comfortable with what you are doing. – Why being original is your enemy. 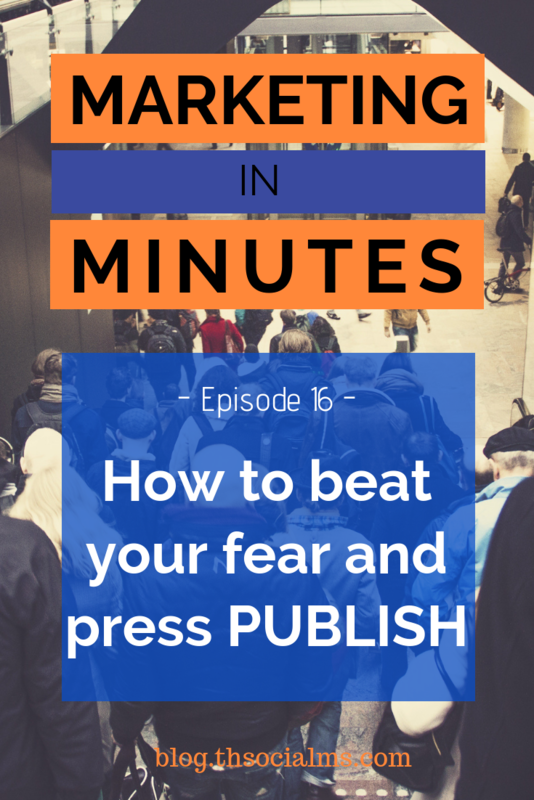 For in-depth information on how to beat your fear and start marketing (and publishing!) today, read our book, The Social Traffic Code! The full transcript of this episode can be found below! I don’t remember the first blog post I wrote, but I’m sure it was pretty bad. I do remember that some of my early posts really messed up my confidence in my skills as a writer. They shouldn’t have. When you are starting out, being uncomfortable with the content you create is normal. And it’s a part of becoming a better writer, and also a better content creator in general. Welcome to Marketing in Minutes – the podcast about all you need to know about Online Marketing in less than 10 minutes per episode. I’m Jonathan Gebauer and today, let’s talk about getting better as a content creator and loosing that uneasy feeling that we all have when hitting publish. The problem with content creation for the web is – as soon as we start doing it, our content becomes visible to an audience. And that gives us an uneasy feeling. I started this podcast not so long ago. I still feel a bit of unease whenever I publish a new episode. But today I know that that’s just part of the deal. But Marketing in Minutes isn’t my first podcast. I started one back in 2015. It was called The Traffic Generation Podcast – and, well… it was pretty bad. It hurts to listen to it today – seriously… That was bad. But it was still an important part of learning how to podcast. And how to publish a podcast for an audience. Here’s the problem – were not all born writers. Or even content creators at all. We are humans – we need to learn skills before we become great at something. And when we start anything online, we expose ourselves to an audience – while we are just learning the skills. But we have to do it anyway if we want to get anywhere. If I hadn’t pressed that publish button on that first podcast episode 2 years ago, I wouldn’t have pressed it today. And that’s true for any part of online content creation. Pressing publish on your first blog post, your first YouTube video, or your first podcast feels uncomfortable. If you want to do anything online, press publish anyway. Without pressing that button, you won’t take the next step. As human beings, we are hard-wired to dislike our own content. Have you ever heard anyone say they like their own voice? Their own handwriting? Just take it from someone who’s been doing this for 8 years: Everyone is afraid to hit that button. This is harder online then it used to be for content creators before everything became digital. Before you were allowed to publish anything online at any time, everything was examined by agents, editors and experts before it was published to an audience. Today, that’s different. No one will check your blog post before you publish it. That’s tough. But if you want to get anywhere, if you want your blog to be read, your podcast to be heard, you’ll need to publish something once in a while. But that doesn’t mean that I can’t give you some helpful tips for content creation that can make your content better – and hopefully make you more confident when pressing that red publish button. Today I want to give you three different tips for how to get more confident about the content you create! When I had the idea for this podcast I started listening to loads of podcasts on the web. Not just marketing podcasts, but podcasts in general. Everything I could find. I found out that I didn’t want to create another interview podcast, so I focused on storytelling shows. I listened to everything so I could to learn what I liked about the shows and how I could implement that for my own podcast. But I didn’t just consume these podcasts, I started to analyze them – to learn how good podcasts sound and feel. If you want to write a lot, read a lot. If you want to be a movie director, watch a lot of movies. And if you want to podcast… listen to podcasts. But don’t just consume! Analyze what you are seeing and hearing – because it will really help you with your own content creation. It will help you make conscious decisions about your content – and when you make conscious decisions you will feel more comfortable about what you publish. But consuming content is just a start. You also need to create. To become a better creator, you need to create often. And the second tip I want to give you is about how to make creating more comfortable for yourself as a creator. And that tip is: Don’t be original. And no, don’t get me wrong – I didn’t say you should copy the content of your posts from somewhere else. I said you should imitate who you like. Trying to be original is really one of the biggest mistakes online creators can make. Developing your own style comes from imitating what you like and leaving out the aspects you don’t like. If that blog post reads like that famous blogger you adore wrote it – awesome, that means you have written something you like. This will not just improve your writing right from the start, it will also give you confidence. Don’t feel guilty about adopting styles from other writers or content creators – we all do it. And as long as you don’t directly copy their work, no one will accuse you of anything. The final tip I want to give you for improving your content creation process over time is to develop your habits and processes. When I’m writing a blog post, I have my own process. Let me get this straight: This is my process, it won’t work for you. You need to develop your own. After releasing a couple of posts, you will begin to get an idea of what works for you and what doesn’t. Sooner or later this will result in your process. Your own routines. So embrace those! They help you to create better content that you feel comfortable with. That were three tips I wanted to give you to create better content. Content you feel comfortable with. Consume and analyze content that is similar to what you want to create. Imitate who you like and what you like. And develop your own routines that work for you and the type of content you create. It will improve your content creation process massively and very quickly you will become comfortable with pressing that publish button. I hope you enjoyed this episode. You can find more information about today’s topics in the show notes which you can find at blog.thesocialms.com/MiM-16. If you like this podcast, please subscribe and share it with your friends. And if you can find the time – please leave a review. It really helps to grow our audience. 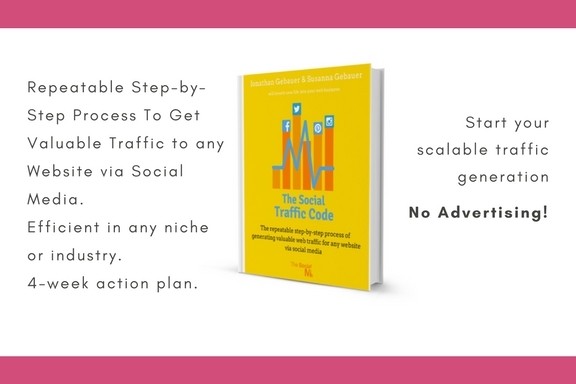 If you want to know more about marketing your blog and business online, take a look at our book, The Social Traffic Code. You can find it through the link in the show notes!